Last week, we published a rendering of the proposed new mixed-use development at 255 Nassau Street, Princeton. A bank will occupy the first floor, with residential housing at the back of the first floor, and on the second and third levels. The latest plan follows on from a previous version, which was rejected by the Princeton Zoning Board of Adjustment last year. 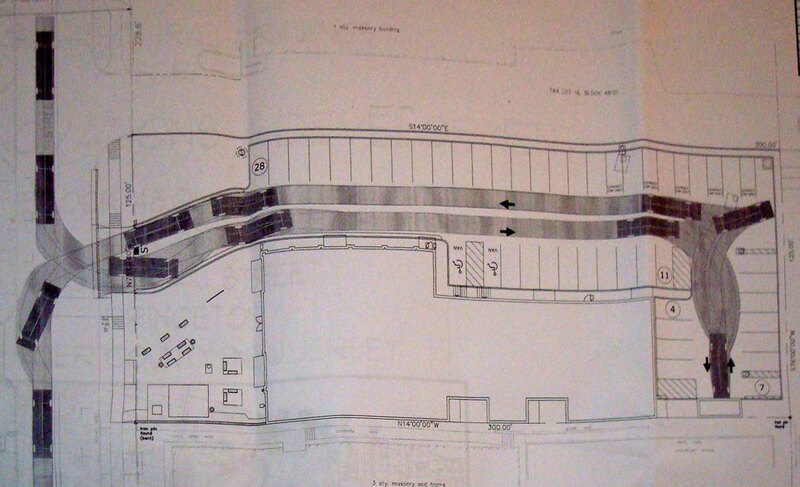 The original application became a subject of concerns about parking and circulation. What is proposed in the new plan? The original plan featured head-to-tail car parking, a feature which is commonly seen at driveways of single-family homes around the area. The new plan has got rid of the head-to-tail parking and provides 50 car parking spaces. To accommodate this very large amount of surface parking, part of the building will have to be demolished. The ten spaces next to the building, including the two disabled parking bays, will be created by this demolition. None of the parking is in front of the building. Instead, a small public plaza will be created facing onto the street. 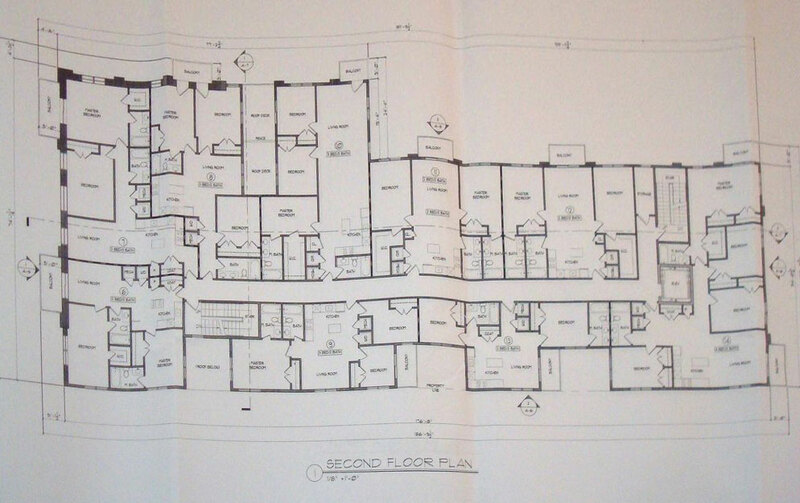 The floor plans of the first and second levels are shown below. The new building will fit 23 residential units, with a bank at the front of the ground floor. 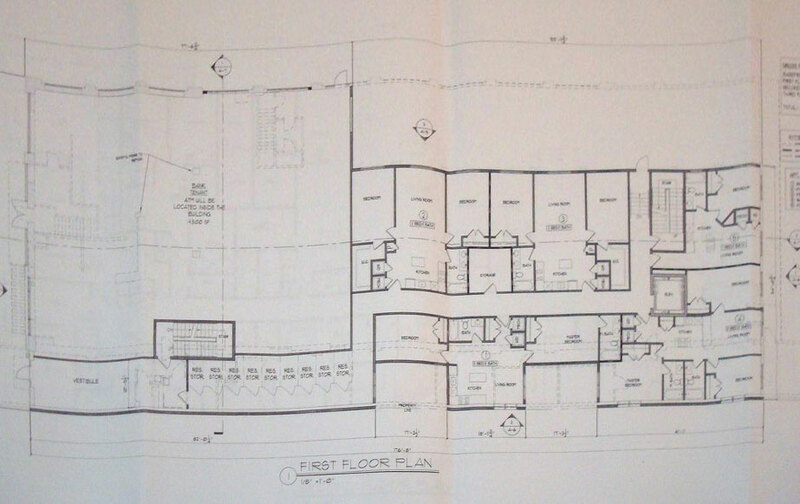 Second floor plan of proposed new 255 Nassau Street (development). Click to expand. Not shown here: the roof deck, which will occupy the middle part of the structure. Access to the site was a major question during discussion of the original 255 Nassau redevelopment plan last year. Currently, access is through a driveway to the north of the site, which is owned by Princeton University. The developer wanted to open a new curb cut onto Nassau Street to allow direct access to the site- a proposal that provoked dismay from several petitioners during public comment. Princeton has no purview over curbcuts onto a State Highway, and it is arbitrary and unfair to argue that all the other businesses in the area can have curbcuts except this one. East Nassau Street is certainly a mess of pedestrian-vehicle conflicts, but it is the town’s responsibility to sort that out. The town should sort it out by creating a small area plan to fix parking access, instead of trying to coerce developers by withholding planning rights for much-needed walkable homes. As we predicted last year, the developer has now obtained permission from NJDOT to open the new curbcut onto Nassau Street. This is sure to be controversial when the plan comes before Planning Board- expect a close reading of the allowed planning ordinances, which were developed specially for this site. It would certainly be better if the front of the development was set aside entirely as a public plaza, but it is not unreasonable for the developer to want their own guaranteed site access. If somebody told you that you could only drive out of your house by using your neighbor’s driveway, you would be right to wonder about what would happen if at some point in the future your neighbor decided to deny access. If the town wants to insist on access to 255 Nassau through the University driveway, they should think about offering an incentive to make it fair for all parties. Let us know what you think about the new 255 Nassau Plan – is the new curbcut a dealbreaker as far as you’re concerned? This entry was posted in Smart Growth, The Parking Question and tagged infill, planning, Princeton, smart growth. Bookmark the permalink. Seems to me that if one site is allowed a curb-cut then so should another. It would be nice if there were incentives for cooperation, though. I hate the idea of stipulating what businesses are allowed to occupy a site: whatever happened to the free market? Why a bank and not, for example, a daycare center? I don’t see why one but not the other should be allowed. Surely the market should decide? Is what fills a commercial space really a planning question anyway? Sure there are some businesses that you wouldn’t want in an urban (if you can call Princeton that) environment: an abattoir springs to mind, but presumably such a business would need a license to operate, so don’t grant one.